Home to stunning beaches, incredible animal experiences, mountains, rainforests, delicious food and must-see sights, there’s no guessing why Sri Lanka has risen to the top of everyone’s travel bucket list of late. Even in the rainy season the temperatures remain at a balmy 30 degrees, the people are always smiling and there’s plenty to see and do. To help you get there fast, we’ve partnered with the American Express Explorer Credit Card. Perfect for avid travellers, with the Explorer Credit Card new members can take advantage of 50,000 bonus Membership Rewards points when they apply online and spend $1,500 in the first three months of the card approval date, as well as a $400 travel credit and two Sydney International Airport lounge entries per year. Now that’s how you travel in style! 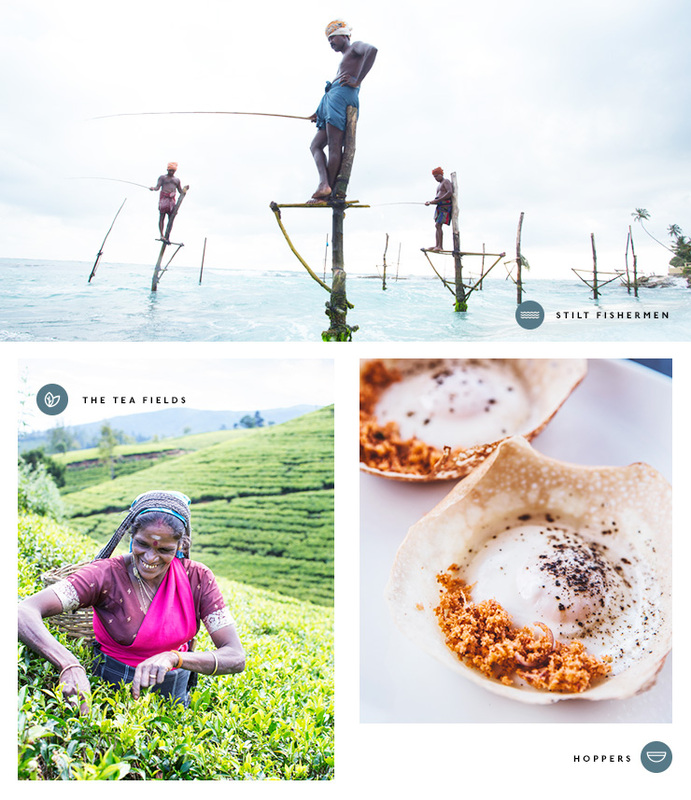 Without further ado, here’s the first-timer’s guide to Sri Lanka, time to get booking. Seeing as your flights will most likely arrive and depart in Colombo, Sri Lanka’s capital city, you should take some time out to explore this culture-rich city. There’s plenty to do, like see the National Museum, ride on a tuk-tuk, check out Galle Face Green (a seaside promenade), get lost in the Pettah markets, admire colonial architecture (like the Old Dutch Hospital) and visit the Gangaramaya Temple. Adam’s Peak, or Sri Pada as it’s known to the locals, is a 2,243m miniature mountain and a place of worship for Buddhists in Sri Lanka. The trip up the mountain in Dalhousie is best made in the early hours of the morning so you get to the peak just in time for a spectacular sunrise. Remember to pack a lunch if you go at it alone, otherwise you can book a tour through Scenic Tours & Travel Sri Lanka who’ll take care of all that and more. Make for the jungles of Kitulgala and sign yourself up for adventure camping with Kitulgala Adventures. Set up camp for one to three nights in the jungle and take part in white water rafting, bird watching, jungle walks, river bathing and more. Waterfalls definitely included. From leopards and elephants to chipmunks and peacocks, there are many creatures great and small to observe in their natural habitat in Sri Lanka. Leopard Safaris run an awesome two-day safari through the Yala and Wilpattu national parks which includes dinner under the stars, luxury tent lodgings and the chance to spot sloth bears, elephants, crocodiles, leopards, deer, tortoise and more! While flying takes significantly less time, there’s so much beautiful scenery to see on the ground in Sri Lanka that a visit is not complete without a train trip. The most scenic route is Kandy to Ella which takes around seven hours one way and passes through lush tea fields and stunning mountainsides. Tickets can be bought on the ground in Sri Lanka from Expo Rail or Sri Lanka Railways. One of the best spots to catch some killer surf in Sri Lanka, Arugam Bay is a must for beach babes and bums, or anyone who likes the laid back lifestyle. The crescent-shaped bay is absolutely stunning—stop by for a few days of rest and relaxation, sun, surf, sand and yoga! Bet you didn’t know that after water, tea is the most consumed drink in the world? Take that coffee drinkers! And Sri Lanka is home to the good stuff. Resplendent Ceylon offer a pretty speccy Ceylon Tea Celebration Package which includes a four night stay in a cottage overlooking Castlereagh late and the Great Western mountain range including gourmet meals and bevvies, plus a private tea experience where you’ll get to learn all about the tea-making process from picking to processing. You’ll also get to plant your own tea bush, attend a tea tasting and a tea masterclass, as well as set out on a night trail where you’ll get to spot wildlife in the area. An instrumental part in any good South-East Asian holiday, some rest and relaxation is crucial. Depending on how much R&R is needed you can choose to laze by your hotel’s pool (which will no doubt be amazing) or for something a little more intensive you can book a yoga retreat at Talalla Retreat Sri Lanka. The six-day retreat includes yoga classes, guided meditations and massage and will surely leave you blissed to the max. There are eight UNESCO World Heritage Sites in Sri Lanka, and if we’re being honest, it’s worth visiting all of them at some stage in your life. If you can only make it to a few you’ll definitely want to check out the Golden Temple of Dambulla (part cave, part monastery), Lion’s Rock in the Ancient City of Sigiriya, the Sacred City of Kandy which is home to the Temple of the Tooth Relic and Ruwanwelisaya in the Sacred City of Anuradhapura. A holiday isn’t a holiday without delicious food and Sri Lanka is home to some incredibly tasty dishes. There’s kottu roti (a deliciously greasy dish of stir-fried, shredded roti), wood apple (Sri Lanka’s answer to the durian, this time smelling of blue cheese), hoppers (Sri Lankan pancakes) and fish ambul thiyal (sour fish curry). 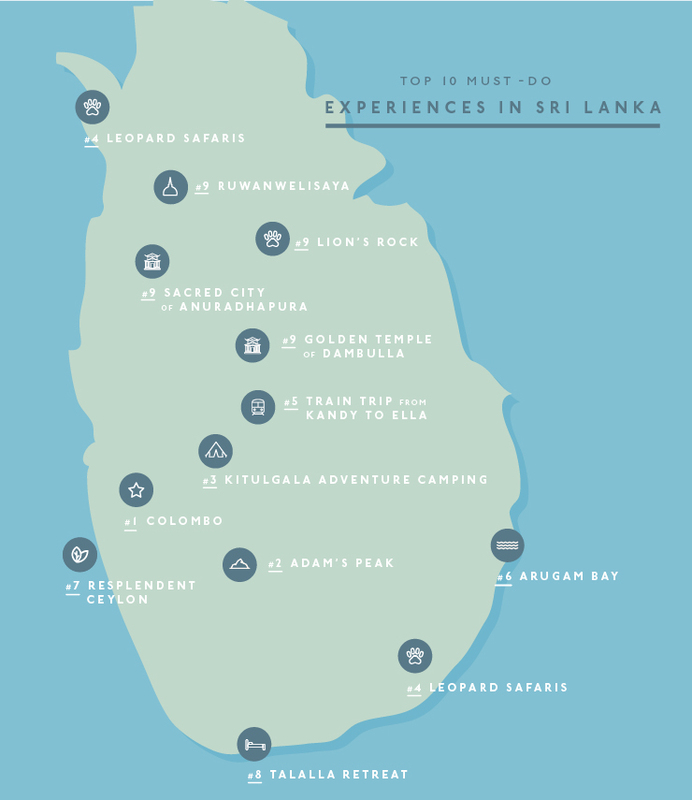 While you can just visit one location in Sri Lanka and call it a day, we recommend traveling around to see all that this island nation has to offer. Whatever you decide, American Express make booking easy—click here to see how! Facing out towards Galle Face Green, the Taj Samudra is more of your traditional hotel, but spliced with a little Lankan charm! Tucked into the UNESCO World Heritage Galle Fort, Amangalla is a primo hotel that you must experience once in your life. 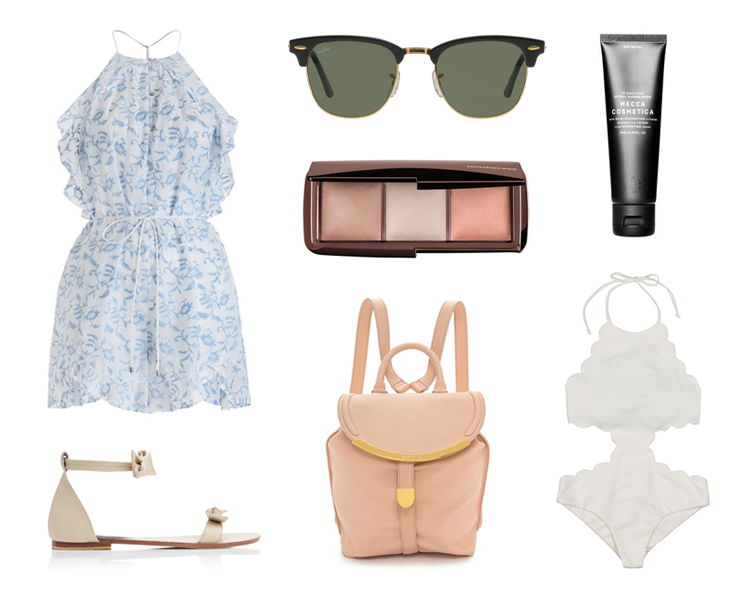 Treat yo’ self! Perched on a rocky outcrop along Tangalle’s coastline, expect stunning ocean views and plenty of relaxed vibes at Anantara Tangalle Peace Haven Resort. Overlooking the cultural city of Kandy the Earl’s Regency is a luxury hotel where hospitality is king. Sri Lanka is home to some delicious street food as well as some high-end restaurants, so expect to come home a few kilos heavier! If you’re a crab fan you need to put Ministry Of Crab on your Sri Lanka bucket list. Housed in the Old Dutch Hospital, the pepper crab is a must, and because you only live once order the crabzilla—2kg of crabby goodness. Right by the Temple of the Tooth, The Empire Cafe is the perfect spot to stop by for coffee, refreshments, Sri Lankan curries and sweet treats. Part of the top notch Heritance Kandalama hotel, Kanchanalak Restaurant offers panoramic views and delicious Sri Lankan fare. You’ll need to make a booking for this one! Tuck into some of the freshest seafood you’ve ever eaten with your feet in the sand at Seafood Cove. Make sure you get there in time to watch the sunset! 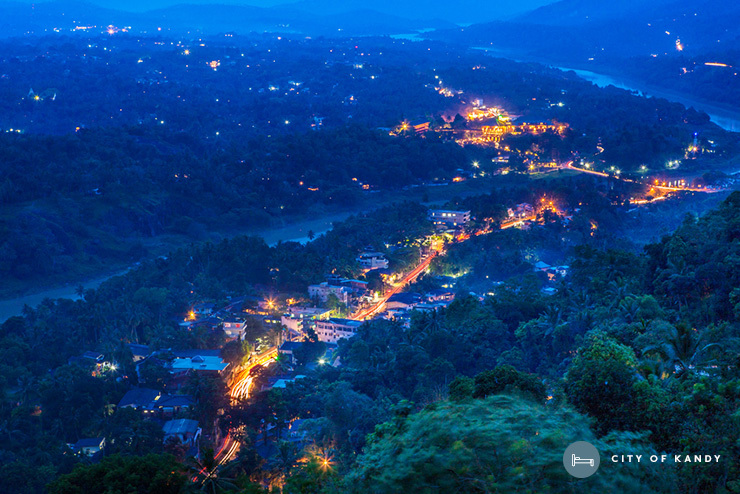 Curries, roti, traditional Sri Lankan eats and more, Kandy’s street food scene is a must! You will have to hop on a couple of planes to get to Sri Lanka, but it’s SO worth the extra effort! You’ll fly into Colombo and once you’re there you’re free to bus and train your way all around the country, we recommend the train though. Perched just above the equator, Sri Lanka experiences warm, tropical weather year-round with distinctive wet and dry seasons. To avoid the monsoons your best bet is visiting between September to April, keeping in mind that December to March is high season when prices are likely to skyrocket. Sinhala, Tamil and English are all spoken in Sri Lanka, with Sinhalese being the most common language. Sri Lanka is more progressive than you think—their flag is the only one in the world that acknowledges different religious groups and it was the first country to elect a female leader back in 1960. Nice work! With so much to see and do in this tiny island nation, it’s easy to forget you’re on holidays, so carve out some time when you arrive or before departing to enjoy some much needed rest and relaxation (and a few massages)!